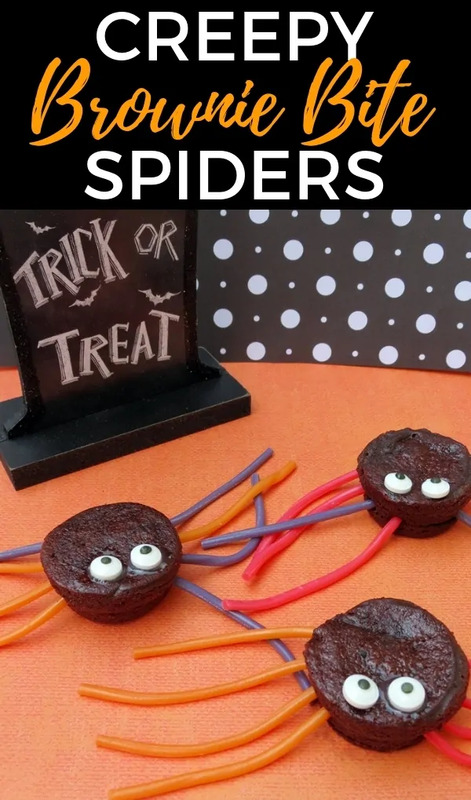 Brownie bite spider treats are perfect for when you need an easy last minute treat for a Halloween party. They are super quick and easy to make. 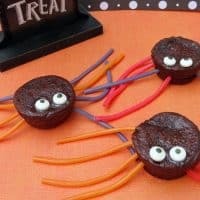 These spooky spider snacks are great for adults and kids of all ages, but I think that little ones will especially get a kick out of these little spider brownies. As you all know, I am by no means above using store-bought snacks and baked goods to create fun holiday treats. Did you see how we used store-bought Rice Krispie Treats to make these 3-ingredient mummy desserts? Starting with pre-made brownie bites makes these spider treats super simply to put together. In fact, you can have the kids make these as a fun Halloween cooking activity (minus any actual cooking). Although, if you want to make your brownies from scratch (or a box mix), go for it. You can use a mini muffin tin to give your brownies a similar shape – like the one we used to make our dirt cup brownie bites. Also, be certain to refrigerate your homemade brownies briefly before poking the leg holes in them to help stiffen them up and prevent them from falling apart. 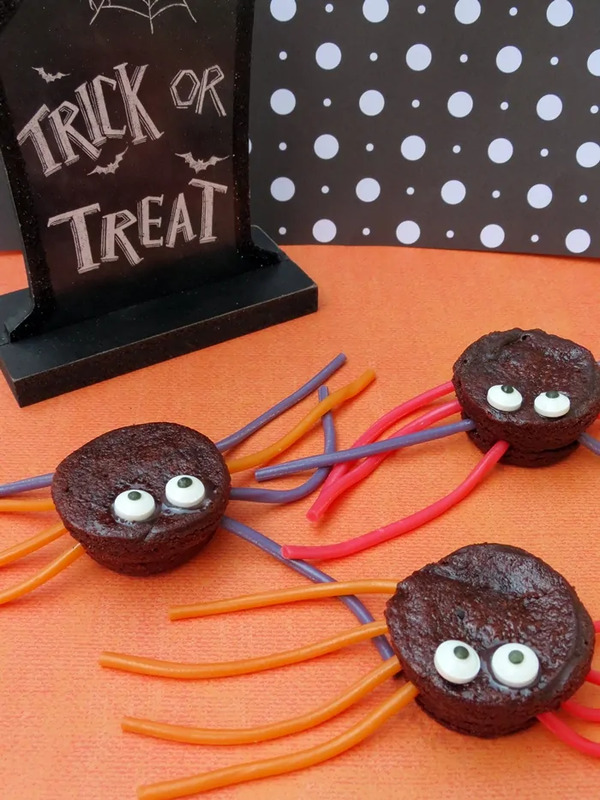 Brownie bite spider treats are perfect for when you need an easy last minute treat for a Halloween party. Use a lollipop stick (or something with a similar shape) to poke 4 holes in either side of each brownie. Combine powdered sugar and water to create a thick icing that can be used "glue". A little bit of water goes a long way so add only a very small drop, stir, and only add more if necessary. When you have the proper consistency, add a dab of the icing to the back of each candy eyeball, then stick them on the brownies. Lastly, dip the end of each "leg" in the icing, then into a hole in the brownie. Repeat until all the "spiders" have 8 legs.